(2009/EMI) 117 tracks 1961-69 including the Joe Meek productions, his solo singles and Cliff Bennett & His Band recordings. 01 Do You Love Him? Cliff Bennett. From the Beatles onwards, everybody pro-fessed to respect Cliff Bennett in the British rock scene of the mid-Sixties, though people rarely bought his records. Bennett was born on June 4,- 1940 and formed his group, the Rebel Rousers, in 1961. The group included Dave Wen-dells (lead guitar), Maurice Groves and Sid Phillips (saxes), Frank Allen (bass, replaced by Bobby Thompson) and Mike Burt (drums). His music was soul-based, and the band's repertoire included songs by Bobby Bland, the Drifters, Ray Charles and Bobby Parker. The eccentric-looking Allen would sing 'Mashed Potato' as well as the original. Later, Bennett added Roy Young to his band, a former Little Richard impersonator, who had now switched to Bobby Bland. 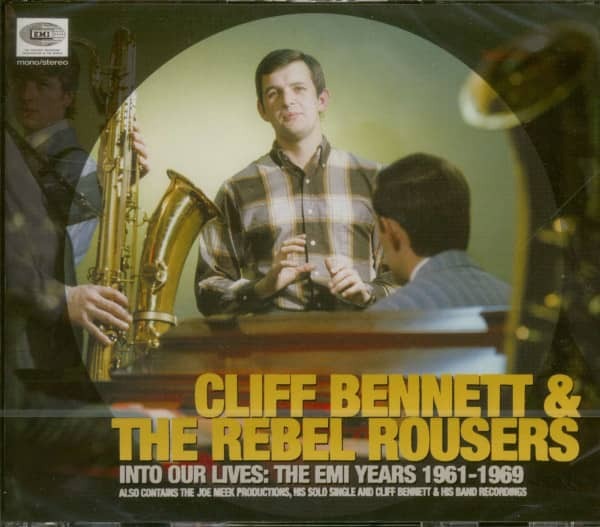 Bennett and the Rebel Rousers had two hits on Parlo-phone : the Drifters' One Way Love' (1964) and the Beatles' `Got To Get You Into My Life' (1966), but their records never went beyond a highly efficient plagiarism. Bennett later formed an unsuccessful progressive rock band, Toe Fat. Customer evaluation for "Into Our Lives - EMI Years 1961-69 (4-CD)"